With shipping ports blocked, Japanese automakers have been airlifting parts to U.S. plants. LOS ANGELES (Reuters) -- A group of shipping companies and a powerful dockworkers union reached a tentative labor deal after nine months of negotiations, settling a dispute that disrupted U.S. auto production. The agreement, confirmed late Friday in a joint statement by the two sides, was reached three days after U.S. Labor Secretary Thomas Perez arrived in San Francisco to broker a deal with the help of a federal mediator who had joined the talks six weeks earlier. Japanese automakers had turned to more expensive air freight to get parts to North American assembly lines. The backup on the docks will cost Honda Motor Co. about 25,000 vehicles in lost production, a company spokesman said. Before the settlement was announced, Toyota Motor Corp. said it had reduced overtime at some factories and Nissan Motor Corp. said it had been somewhat affected. Subaru said production remained unaffected as it airlifted parts. Honda said yesterday that it planned to continue to reduce production at plants in Indiana and Ontario next week because of part shortages. Honda said it expected output loss at the factories next week to be around 5,000 cars. But Ohio plants that were slowed last week will be back at full production Tuesday, the automaker had said. Honda’s plant in Greensburg, Ind., which builds the Honda Civic and Acura ILX; and its factory in Alliston, Ontario, which makes the Acura CSX and the Honda Civic and CR-V, will continue to be affected Feb. 24 to March 2, Honda had said. The White House called the deal "a huge relief" for the economy, businesses and workers. President Barack Obama urged "the parties to work together to clear out the backlogs and congestion in the West Coast ports as they finalize their agreement," the White House said in a statement. 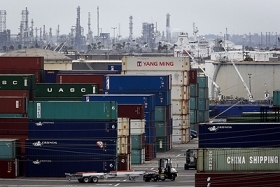 The 20,000 dockworkers covered by the tentative five-year labor accord have been without a contract since July. The dispute had reverberated throughout the U.S. economy, extending to agriculture, manufacturing, retail and transportation.